This private zoo of an eccentric collector or a crime lord is built inside a small crater. The center of the zoo has no roof and features an exotic beast burrowed underground. The building is not designed for permanent residents, but has a single bedroom with facilities for extended stays. I got the idea for this map from one of my $5 tier patrons and it was very interesting to design. 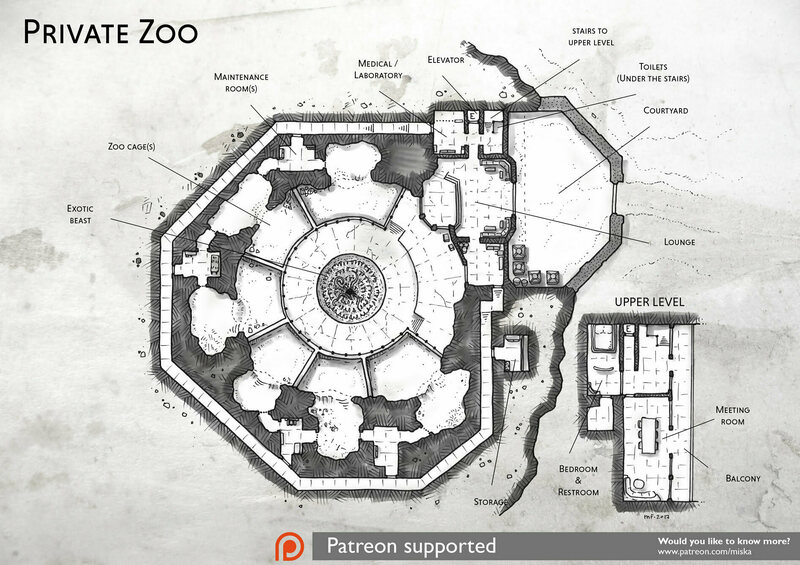 Not too many private zoo maps out there either 🙂 Also, the idea behind this map was that the zoo cages would not hold only beasts, but various sentient species. What a twisted and great idea for a more nefarious villain! (like a particularly nasty Hutt crime lord, for example). I hope you like this one or find it inspiring.